I took this shot on my first trip to Iceland. Having never been there before, I didn’t know what to expect but what I found was incredibly cool. The trip from Keflavik airport to Rejkyavik is through old lava fields. These are fields of uneven black rock that stretch on for miles. And if you go at the right time of year, they may even be covered in fine layer of green and red moss. You don’t necessarily notice it right away but it slowly dawns on you that there are no trees around. The joke, we were told, is “if you find yourself lost in a forest in Iceland, just stand up.” I thought it was pretty funny. Iceland has so many things most of us rarely get to see. Such as lava fields, glaciers, geysers, northern lights, puffins and so on. 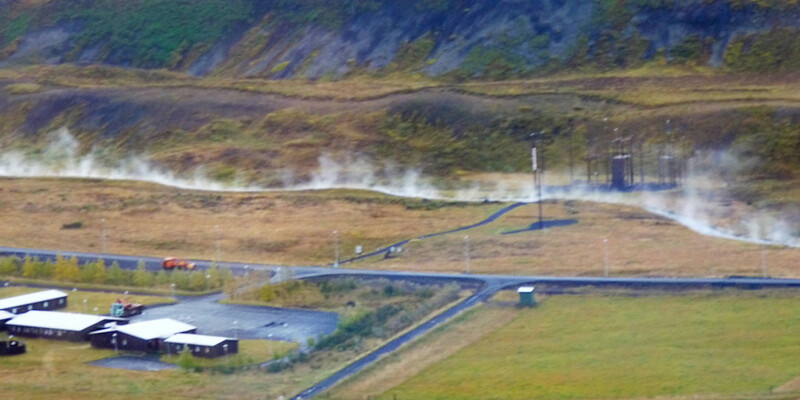 They also have an immense amount of geothermal activity and this causes some really interesting sights. We had taken a day trip and on one of the stops we were able to look out over a valley and there was a stream flowing through it. But the water was significantly warmer than the surrounding environment, which caused there to be a nice layer of steam floating above it. It was like a scene out of a movie. Later on while we were driving around we kept seeing these little clouds of steam coming from small chimneys off in the distance. When I asked what they were, I was told that they are steam farms. Basically, people tap into the hot water underground and use it to create energy which they then share with the electric companies. I’m not sure if this is true but it sounds plausible and similar to the whole solar thing we’ve got going on. Soon enough we came across one of these steam farms much closer to road and I was able to snap a picture of it. I took it through the bus window and the lighting wasn’t too good so the original shot wasn’t so spectacular. Because of that, I decided to pump up the saturation a bit, crop it and apply some sharpening. I ended up liking how it came out. The steam almost has a 3-D effect. It just pops in the picture.Great shot and manipulation. Thanks Sudha! I was going for that but you never know what other people will see. And thanks for checking out my blog.